Every day, Watch This offers staff recommendations inspired by a new movie coming out that week. This week: The Hateful Eight and The Revenant have us thinking about modern Westerns. Like his countryman Bong Joon-ho, South Korean director Kim Jee-woon is known as a multi-talented genre stylist. For example: Before The Good The Bad, The Weird, Kim directed a grim, violent gangster movie, A Bittersweet Life, and a creepy, atmospheric ghost story, A Tale Of Two Sisters. None of those adjectives apply to Kim’s take on the spaghetti Western, referred to alternately as an “Oriental Western” (in the credits) and a “kimchee Western” (by Kim himself). 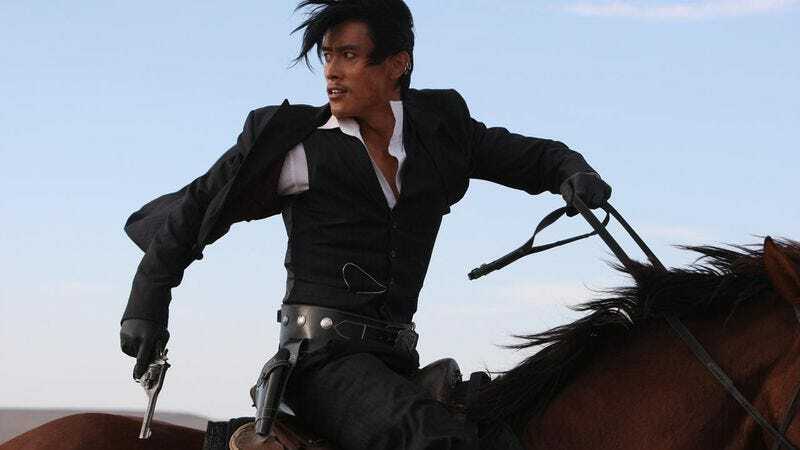 Instead, it’s a kinetic, occasionally goofy action movie, bookended by a train robbery and a shootout with an extended chase sequence in between. The Good, The Bad, The Weird plays tribute to the all-time Western classic The Good, The Bad, And The Ugly in more than just its title, quickly setting up three protagonists whose personalities, wardrobes, and interpersonal dynamics all resemble those between Clint Eastwood, Lee Van Cleef, and Eli Wallach in Leone’s film. There’s Park Do-won (Jung Woo-sung), the “Good” bounty hunter in the long brown duster; Park Chang-yi (Lee Byung-hun), the “Bad” killer for hire in the sharp black suit; and Yoon Tae-goo (Song Kang-ho), the “Weird” bandit in goggles and leather vest. Befitting his character’s nickname, Song delivers the most outwardly hammy performance (an inept gang of Manchurian bandits pursuing the trio comes close), although Jung and Lee both seem to be having fun twirling shotguns on horseback and delivering deadpan tough-guy dialogue. The double-crosses and secret identities can get complicated, but this isn’t really a “plot” movie, anyway. It’s a movie made for having fun and geeking out, full of winking references to other films, both Westerns and non-Westerns—keep your eyes peeled for the Japanese army official in the black overcoat straight out of an Indiana Jones movie—and many exhilarating, excellently staged action scenes. Kim even manages to keep the nuances of who’s shooting at who and where clear despite extensive use of shaky cam (did we mention this movie was shot in 2008? ), which is remarkable in and of itself. Availability: The Good, The Bad, The Weird is DVD from Amazon, Netflix, or possibly your local video store/library. It’s also currently streaming on Netflix, and can be rented or purchased from the major digital services.